Prospective students should have beginner level coding experience. Graduates will earn a certificate from SDCS. Each student will be prepared for multiple collaboration situations in the workforce such as pair partnering, group projects, mob programming, and individual projects. Students are exposed to the principles of high performing engineering teams and learn to adapt and thrive in challenging situations faster and more effectively than they ever could prior to attending the program. Job placement assistance is offered until students get a job. The best code camp in San Diego, hands down! Helped me code and land a job! 1 week, we guarantee you won't get a job if you don't do the work. Why is San Diego Code School (SDCS) the best code camp in San Diego? The cuttting-edge technolgy stack you will learn, the access to a career network, the intimacy of the classroom- with instructors that are able to help you in real time in those moments you feel stuck, the camraderie of fellow students who share your goals, instructors who want you to get that job and not just stand on the other side of a transaction, and a unique North County location. Simply put, SDCS delivers a 'coding education' that no other school in San Diego of any sort (code school or traditional university) offers, even if they wanted to. It used to be overwhelming to contemplate where to even begin when it came to learn how to code. Now, I feel empowered to say I have a new set of skills as well as a newfound confidence in being able to learn addiitional things on my own, after having finished my education at SDCS. Truth be told, anyone can teach themselves to code. The information is readily available on the internet. But this just makes things so much easier! Being lead by industry professionals that mentor you, telling you what is useful to learn/implement, and perhaps most importantly- what is not, is an invaluable resource that will jumpstart a rewarding and fulfillng career. If you are thinking about a code school, I can't recommed SDCS enough! They have changed my life and I will forever be grateful to them! When I was researching coding boot camps in San Diego my friend recommended working with Michael Roberts since she had completed his curriculum and got a job. That gave me confidence in San Diego Code School and in their program. Michael is a very knowledgeable instructor and very good at showing students how to solve a problem instead of just providing you the straight answer. You do need to research on your own before asking for help. Now he is helping me review my resume and start the job search process. Before taking the program I tried to learn to code on my own through a couple high school classes and self-teaching. It was not working and I realized I really needed help because I would only code for a while and then give up when it got tough. Fortunately, I went through the program while it was in beta and the price was very affordable. I felt that I got a lot of support from staff and fellow students, so it was not really a problem that it was "remote". Everyone is helpful and I wasn't ever stuck like I was when learning on my own. During the in person meetings forums and mob programming I felt like I was really learning. I got a lot of 1 on 1 help from Michael and I feel that the program really prepared me for the job search and technical interview. This program helped me land a great job which was something that was a concern for me when I signed up. Even though I live outside of San Diego, I got a lot of help and resources to find a job where I live in LA. Without this program I would not have been able to learn to code quickly. I am so glad I made the choice to attend. One of the most important things a bootcamp can have is knowledgable and dedicated teachers. Michael is incredibly well versed in software development and definitely takes the time to get to know his students and offer the best help he can to guarantee success. The program also includes numerous project which help the students build their portfolio and even a project working directly with a local company as a final project! Once you finish the program you will be ready to enter the job market and be productive with a focus on scrum and agile programming. .I would definitely reccomend this course to a friend! This is setting me up for my future! I was very hesitant at first to make the leap into a coding bootcamp. I thought the only possible way to get into a career of Software Development was to obtain a Computer Science Degree. After some research and reading a lot of success(more success than failure) stories from bootcampers that made it into the industry, I thought it was my turn. I tried to go at it alone with freeCodeCamp and Team Treehouse at first. I was still working full-time at about 50-60 hrs a week, so it was getting difficult to juggle work, coding and family life(wife and one year old) at the same time. Obviously, coding had to take on a third wheel role at that point. I knew I had to make a decision about my future because my current career was taking me away from my family for days at a time(field support engineer) and I had reached the top of the ladder in my current role. We had saved up enough money, so that I could take at least a couple months off to learn coding full time. In order for me to accomplish a goal of learning how to code in a short amount of time, I knew an immersive coding bootcamp was the only way to go as you would have an instructor and fellow students to help you get “un-stuck". My family was 100% supportive in me taking the leap, so I started make the arrangements. I first looked into another coding bootcamp before looking at SDCS. I toured the facility and attended a mob programming session along with a Codewars challenge. I interviewed a couple students as well. They told me about the highs and lows of learning to code, but it was still the best decision they had ever made. This really solidified things for me. Over the next two months, I quit my job and signed up for the course! But alas, that school had closed down. Here came Michael(Founder of SDCS) to the rescue with all the same bells and whistles that the other school provided. With Michael’s 30+ years experience, knowledge of programming and his connections within the industry, I knew choosing his program was the right decision for me. And it didn’t hurt that the cost was MUCH more appealing. I am getting close to the end of the program now and I do not regret my decision to join one bit. The road ahead is still difficult and there is still SO much to learn, but Michael really helps you to think about problems in a different way and to break them down into smaller manageable chunks. I really enjoy the mob programming sessions as you get to work with a team to solve a common goal. You get to see how other people would solve the same problem and it lets you know what you need to work on learning more of. Same goes for code challenges, which still pull me back down to earth. The best part is learning NEVER stops. You are faced with new challenges daily. 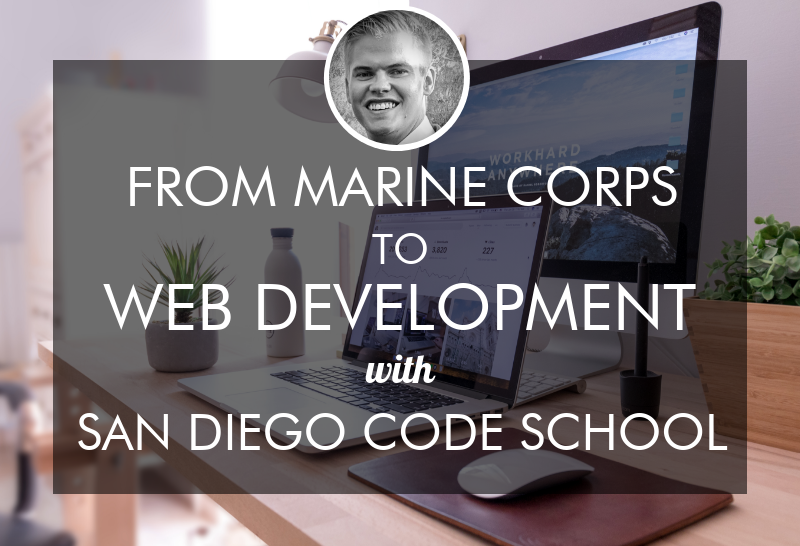 I strongly recommend Michael’s program and San Diego Code School, not only for the cost to value, but for the shear amount of knowledge you obtain in such a short amount of time. Any other information you'd like to share with Michael from San Diego Code School? By submitting, I acknowledge that my information will be shared with San Diego Code School. An email with these details has been sent to San Diego Code School. You've already applied to this scholarship with San Diego Code School.